The Open University has just issued its third annual ‘Innovating Pedagogy’ report in which it claims that education can be dramatically enhanced by social networks. The report identifies 10 methods of teaching, learning and assessment that are gaining influence but which have not yet had a major impact on education. One of these is massive open social learning which brings the benefits of social networks to people taking online courses by enabling them to recommend, like and follow the best content created by other learners. 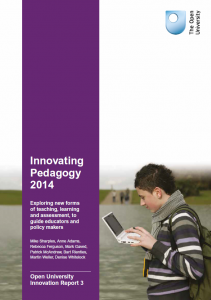 The report has already generated debate on the Association for Learning Technology members’ discussion mailing list, with some members noting that the report is not a sales pitch or checklist for new ‘must-have’ technologies (which might be useful to education), instead that pedagogy is the central theme of the series and the extent to which new innovations can enhance and extend good pedagogy and practice is explored and discussed.